Destroyed houses are covered with mud at a damaged area in Hiroshima, southwestern Japan (July 11, 2018). While dealing with the aftermath of Japan’s worst flood disaster, residents are now suffering from potentially deadly heat. Disaster-struck areas in west Japan are bracing for a prolonged heat wave just as survivors begin the painstaking task of cleaning up after torrential rainfall triggered landslides and floods, killing 222 people earlier this month. Over the long weekend, sweltering heat was the biggest challenge for rescue and recovery efforts as temperatures topped 39 degrees Celsius in landlocked areas. In the worst-flood hit districts of Okayama, Hiroshima, and Ehime Prefectures, the mercury clocked highs of 36 degrees C. By Monday, the death toll stood at 14 with another 2,061 people treated in hospitals for heatstroke and heat exhaustion. The Japan Meteorological Agency says there isn’t any relief in sight, with blazing heat predicted for at least another week as two high pressure systems circulating over east and west Japan block moisture from the atmosphere. Adding insult to injury for desperate survivors, private bathing facilities and water to clean clothes remains a luxury in many areas. In Kurashiki city in Okayama, residents celebrated the return of tap water, which was disrupted when the torrential downpours began 12 days ago. However, a large section of Hiroshima is still suffering from water shortages and residents are capped at 12 liters of water per person at municipal water collection points. The Ministry of Health estimates 103,400 households in west Japan are without running water and are struggling to stay cool in dangerous weather conditions persistent through the night. Government agencies are urging affected residents with broken air conditioners to move to locations with air conditioning, even advising past evacuees to return to evacuation centers with cooling. According to the Fire and Disaster Management Agency, 4,500 people remain in evacuation centers across 16 prefectures but access to water remains limited within those centers. Ongoing search and rescue operations are underway, with the help of 81 helicopters and 26,000 police, fire department, and Self-Defense Force crews on the ground. In Ehime and Okayama Prefectures alone, 3,600 volunteers worked on day one of a three day weekend to clear sand, mud, and debris in punishingly high temperatures. In Hiroshima, a road closure to the airport was lifted, enabling airport shuttle buses to resume operations. In areas where water remains cut off, municipal governments are warning of fire risks from submerged cars and solar panels that could cause fires if started abruptly. Local firefighters say such scenarios would be especially deadly without access to functioning fire hydrants. When re-examining the death toll from the country’s heaviest rainfall recorded in three decades, new statistics reveal the elderly accounted for 70 percent of the victims. While some heard emergency warnings but chose to remain at home, others may not have been able to access accurate emergency information from a mobile phone or may not have gauged the level of urgency from the warning. Flood victims in heavily flooded Okayama Prefecture scrutinized the Japan Meteorology Agency’s approach in initially emailing residents an evacuation order alongside a television broadcast at 10 p.m., followed by a more dire emergency warning 40 minutes later. Some residents also argue that they simply didn’t hear or understand the PA announcements that were relayed on July 6, when the intense downpours started. The Ministry of Land has defended the adequacy of warning systems but also vowed to review the way warnings are distributed in times of crisis. Machinery and agricultural damage so far is being calculated at 48 billion yen ($429 million), but with the government still investigating the damage costs are expected to rise. At an Emergency Response Headquarters meeting on Monday the government pledged to expand financial support through five-year interest free loans to help small- to medium-sized fishing, forestry and agricultural businesses get back on their feet to resume operations as quickly as possible. 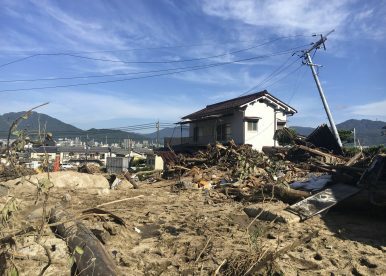 Recovery operations are underway after Japan’s worst rain disaster left a trail of unprecedented destruction. What Japan's 'Proactive Contribution to Peace' Looks Like in NepalUS-Japan Trade Agreement Negotiations: Why Now?Is Japan Anti-China?Japan’s New Imperial Era: What’s in a Name?South Korea and Japan: Where to From Here?